Arnold Willis Jensen, the son of Jens and Nielsine (Flint) Jensen was born September 19, 1930, in Ringsted, Iowa. Arnold departed this life on Tuesday, July 31, 2018, at his home in Ringsted at the age of 87. Arnie received his education and graduated from Ringsted High School in 1948. On August 22, 1948, Arnold was united in marriage to Lois Madsen in Ringsted. Lois passed away August 23, 2008. Together they made their home in Ringsted, raised their three girls, farmed, and owned and operated the local gas station. 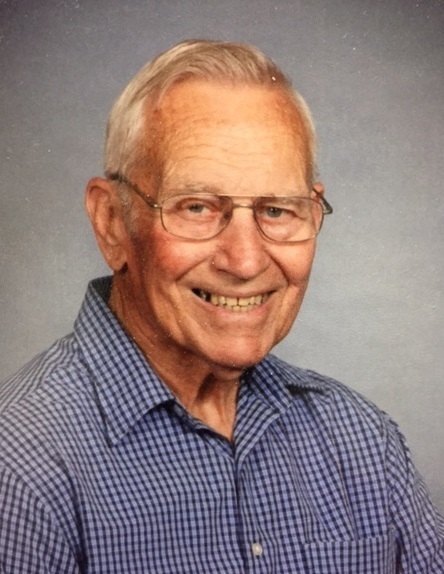 Through the years he worked for the Ringsted Implement as a mechanic, at the Hardware Store, and the City of Ringsted water/maintenance department. He served as Mayor of Ringsted for many years. After retiring he worked for some local farmers as an extra set of hands with their livestock and fieldwork. In the last years of his life he found a special friend and partner, Sherril to share the remainder of his life with. Arnie was a member of United Lutheran Church in Ringsted, Iowa. Left to cherish his memory are his partner and friend Sherril Nichols of Ringsted; his children, Kathryn Green and her husband, Allen of Des Moines, Iowa; Donna Elliott of Webster City, Iowa; Jean Griffith and her husband Randy of Culpeper, Virginia; five grandchildren; seven great grandchildren; sister-in-law, Carol Sheehan of Waukee, Iowa many nieces and nephews; Sherril's family, Kenneth (Diane) Nichols of Colo, Iowa; David (Deb) Nichols of Colorado Springs, Colorado; Jim (Kathern) Lancaster of Charles City, Iowa; and Amy Nichols of Colo, Iowa. Arnie was preceded in death by his wife Lois, parents, Jens and Nielsine, and his four brothers, Harry, Ray, Henry and Earl.